Well, this is a timely one! Two weeks ago I started mapping out our website update schedule for the upcoming month – in anticipation of TAGAP Day 2017 – and I had slotted one of the missing The Penned Guin comics for this week. 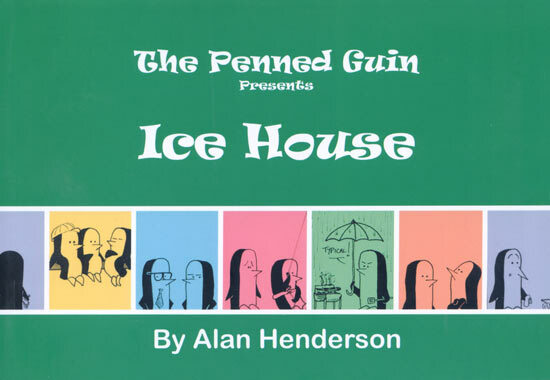 So, here are more pun-tastic birds from the mind and pen of Alan Henderson, The Penned Guin Presents: Ice House. As you'd expect, it's another 180 strip collection from Henderson's amusing penguin musings and I wholly recommend it. And what do you know, during the weekend leading to this, the pun-master Alan Henderson launched a new Kickstater for the next Penned Guin compilation, To Coldly Go, which collects the next 180 strips. So, if you'd love to give these amusing waddlers a go, do consider jumping aboard the Kickstarter.